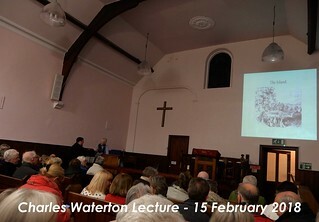 I attended an excellent presentation by Barbara Phipps about Walton’s most famous son, Charles Waterton of Walton Hall. I decided to write a brief account of the event for my blog – I hope I have not misunderstood anything, any errors here are my own. I hope this is a fair account and summary of the presentation. The event was extremely well attended and as a result was moved to the bigger venue of Walton Methodist Church. There were at least one hundred people present, showing that Charles Waterton is still a man of profound interest to the people of Walton. The presentation was divided into two parts. The first addressed Charles’ ancestry and the second Walton Hall and its park. This part of the lecture discussed his parents and siblings and how provision had to be made for the economic futures of his brothers and sisters because only Charles, as the eldest son, would inherit the estate. The prospects of all Catholics were limited after the English Reformation which made it difficult for Catholics to earn a living. It was explained how the continued Catholicism of the Waterton family hampered its prospects and expectations. This led to discussion of how the family became slave owners when his father bought two plantations in British Guyana in South America to provide livings for Charles’ siblings. Charles was against the slave trade and argued against it in print – he wrote that slavery could never be defended. However, he felt there was not much he could do about it. He did what he could under the circumstances showing kindness to the slaves when he was running the plantations after he contracted pneumonia and was dispatched to South America to recover. Despite his negative opinions about slavery, the Waterton family benefited financially when slavery was finally abolished by Parliament. Around £31,000 was received by the family for 592 slaves and much of the money may have eventually have filtered down to Charles. Nevertheless, Charles was identified as an awardee but not an owner – the actual owners would have been his siblings. The presentation then addressed the ancestry of Charles’ wife, Anne Edmonstone, who was the daughter of a close friend, Charles Edmonstone, that he met while in Demerara in South America. She was the descendant of an American Indian princess. Due to her father’s work in capturing runaway slaves her family also had the stain of slavery attached to it. Anne was obliged to convert to Catholicism on marrying Charles and she became a devout Catholic, as indeed did her other sisters. They were married in a convent in Bruges. She died shortly after giving birth to their son, Edmund, and this was something that Charles dwelt on and blamed himself for the rest of his life. Charles’ ancestry from the earliest times was then outlined, starting with ‘The Ancients of Deeping Waterton’ (1159-70) which was the first historical reference to the Waterton family. The presentation went on to refer to the Waterton that fought at the battle of Crécy (1346), Sir Robert Waterton who was governor of Pontefract Castle during the imprisonment of Richard II, who died there in 1400, and Thomas Waterton who fought and died for Charles I at the battle of Marston Moor (1644). This last reference led onto the story of how Thomas’ wife confronted the roundheads who fired on the old Walton Hall and how she returned fire with a swivel cannon injuring one of the besiegers. It also led to the story of how Charles’ father gave him the cannonball that was used as a present. If it wasn’t for the Reformation the Watertons would probably have enjoyed great prestige within the country, but their Catholicism prevented this. Indeed, the lecture referred to how at one-point Charles Waterton’s grandfather was actually imprisoned for Jacobite sympathies. The second part of the lecture moved away from the history and pedigree of the Waterton family and onto details about Walton Hall and the surrounding park. It was noted that the original fortified medieval house that was located on the island was demolished by Charles’ father who then built the current Palladian mansion (c1767). It was a common activity at the time as wealthy families began to replace their draughty fortified dwellings with more comfortable homes. The age when fortification was needed for defence had passed from English history. That the arches at water level where the hall meets the lake were actually where supplies, including coal, were brought to the hall by ferry (Charles named this Charon’s ferry in reference the ferryman of Hades who transported the dead across the rivers Styx and Acheron in Greek mythology) across the lake. Currently the room above the area is the dining room though in Waterton’s time it was explained that this was the location of the kitchens. That, if I heard correctly, Charles Waterton’s sleeping quarters were located on the top floor at the same side of the house as the kitchens mentioned above. Next to this was the room where the Waterton’s priest lived. A personal priest was necessary because at the time it was illegal for Catholics to publicly receive Mass so it had to be done privately behind closed doors. The audience was informed that on the other side of the building on the same floor was a private chapel where the Watertons would receive Mass. That Charles Waterton was kind to the poor of Walton who could come to the kitchens and receive food. It was explained that the title ‘Squire’ was not an official title but one bestowed upon him by the people of the village as recognition for his local philanthropy. 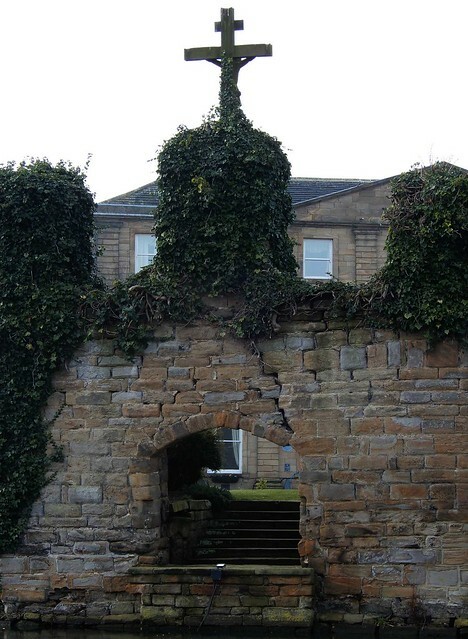 That the last remains of the old house, The Watergate, had a swivel bridge to allow people to move to and from the hall on its island. Near the Watergate, Charles Waterton grew a yew hedge and sited a starling tower to attract starlings. Some slides were displayed showing an outline of the hall, islands in the lake, the park and the location of some key features. Some of the key features that were identified included the restored bird hide, ‘Waterton’s Watchtower’ as well as a derelict bird hide on the other side of the estate, the location of Charles Waterton’s grave, the route of the canal next to part of the perimeter wall, and the site of the ornamental and vegetable gardens. The location of the gates in the wall were indicated. 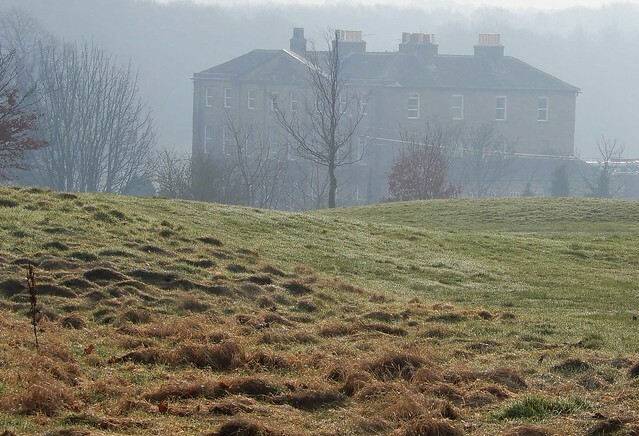 Barbara speculated that the gate on the far side of the estate was likely to have marked the start of a carriageway from the Walton Hall estate to another great Palladian mansion in the area – Nostell Priory. 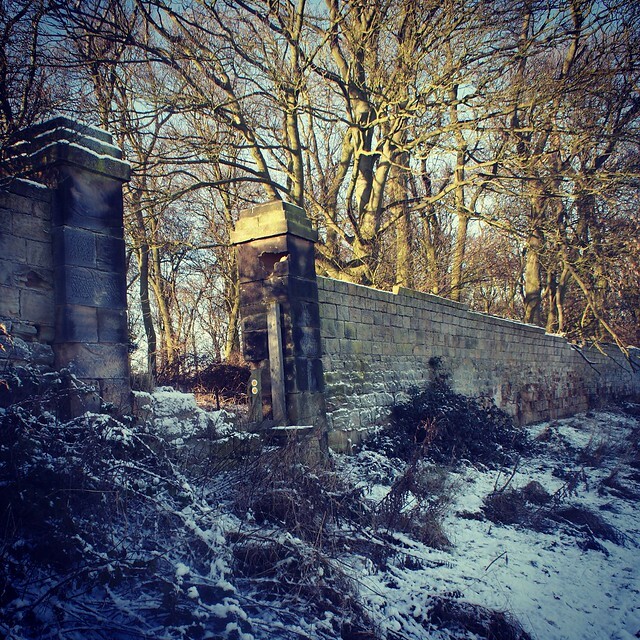 The Watertons and the Winns of Nostell were apparently very good friends. Some time was spent looking at and discussing the unique Boulby Sundial (1813) that is located on the island behind the house. This was the creation of a talented local mason from Crofton called George Boulby. It contains 20 equilateral triangles and shows the time in different parts of the world. Many of the places labelled were the very places that were familiar to Charles Waterton from his travels so he must have had them inscribed. It also shows the compass points and marks the equinox. Unfortunally the sundial is becoming eroded and is in great need of protection. The Wall was the next feature that was considered. This is perhaps Charles Waterton’s most famous construction. It was not designed to keep animals in his nature reserve but to keep predators out. 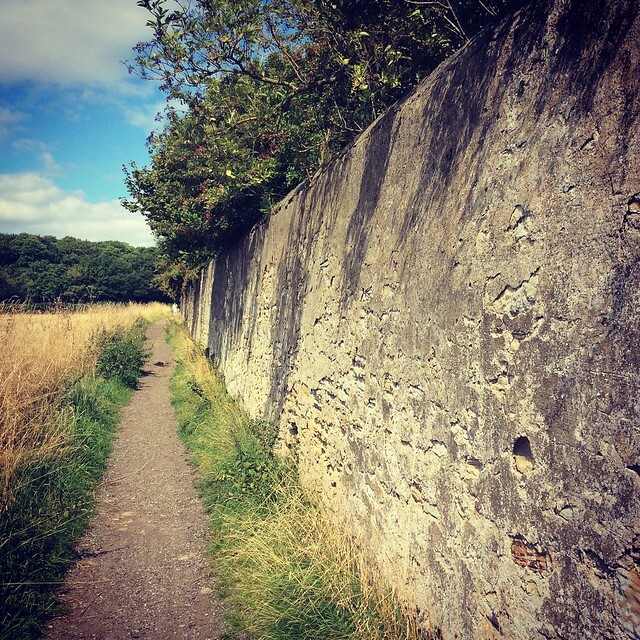 The height of the wall was designed to exceed the ability of foxes to jump into the park. It was also designed to exclude poachers. Waterton also made the point of not allowing guns within the walls. The wall was built at a cost of £9000 which Waterton said was the money he had not spent on wine, owing to his commitment to be a teetotaller. Construction took place intermittently when the necessary money was available. The location and nature of the Grotto was pointed out. 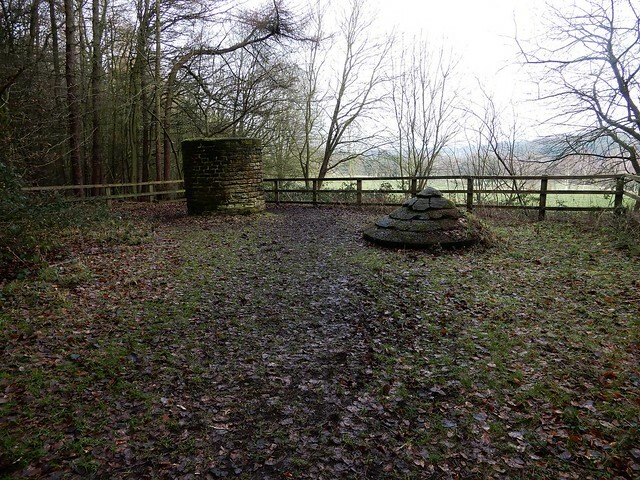 This structure was part of Walton Hall’s pleasure gardens and located on the Brooklands side of the estate. In keeping with the attitudes that made him well liked in the village, Waterton made this area open to the public, by appointment, and allowed picnics to be held where local people could enjoy the fresh air. ‘Waterton’s Watchtower’ a bird hide restored in 2005 was the next feature of the park to be discussed. This is located near a creek that has since dried up. It was explained that all the hides had a design fault in the roof. This is why the restored conical roof of the restored hide is located on the ground next to the hide itself. The next part of the grounds to be outlined was described as ‘the working hub of the estate’. This consisted of the stables, Blacksmiths shop and forge, and there was a pigeon cote with 666 nesting holes in the courtyard. The pigeons themselves were, interestingly, bread as food source and source of income. Barbara then turned peoples’ attention to the lake, which is man-made, and referred to the time when the lake was drained after Waterton became concerned about the quality of the water. As it turned out there was a great accumulation of mud in the lake due to it emptying from the top. It was while the mud was being removed that the swivel cannon, presumably the one used to fire on roundhead soldiers during the civil war, was found. To correct the mud accumulation problem, Waterton built the sluice gate that is near the current carpark. 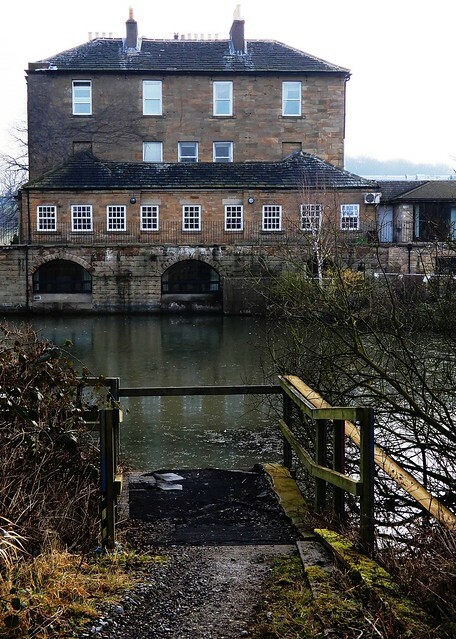 This drained water from the bottom of the lake and took it underground across the estate emerging near what Waterton referred to as the ‘John Bull’ tree and then on into the beck that now runs past Brooklands. This solution to the problems of the lake was a magnificent, though unseen, engineering achievement. The final point of interest in the park that was discussed was the final resting place of Charles Waterton himself. The position of Waterton’s grave was pointed out at the far side of the lake. 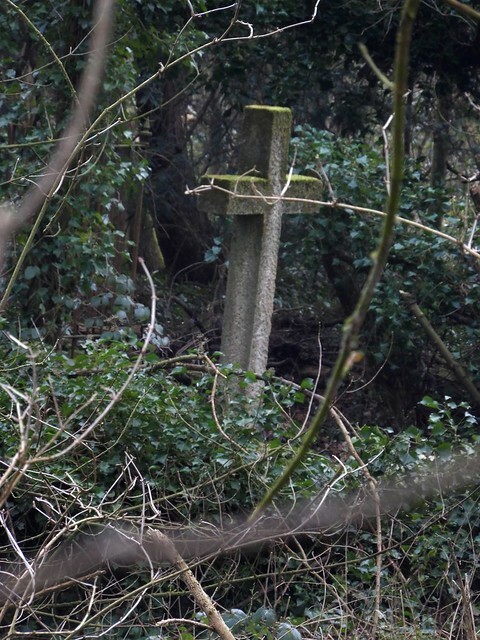 It was noted that the cross in front of the grave was made of concrete, the original stone cross had been stolen many years ago. When he died a Requiem Mass was held at the hall before Charles Waterton’s coffin was conveyed, quite poetically, on the ferry Charon to his Grave. The lecture concluded with a discussion about Waterton the man, and what sort of person he was. The lecture was well worth attending and if it is held again I would recommend people to attend. This entry was posted in Uncategorized and tagged History, Local History by cjknowles1972. Bookmark the permalink.